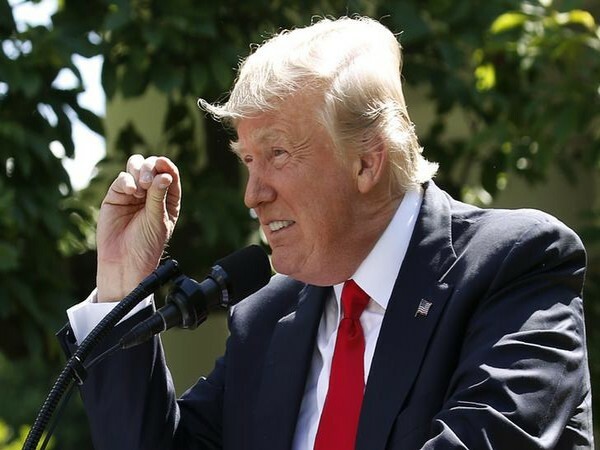 Washington [U.S.]: While announcing America's withdrawal from the Paris Climate Change accord, U.S. President Donald Trump also made a direct and no-holds-barred attack on India in which he accused New Delhi of trying to extract "billions and billions and billions" of dollars in foreign aid from the developed world to sign up for the climate accord. In an epic rant on Thursday, Trump categorically said - "India makes its participation contingent on receiving billions and billions and billions of dollars in foreign aid from developed countries." In his 3000-word, 27-minute euphoric speech made in the White House Rose Garden, Trump repeatedly slammed India, China and the rest of the world. He cast the U.S. as a victim of global machinations. "America is USD 20 trillion in debt. Cash-strapped cities cannot hire enough police officers or fix vital infrastructure. Millions of our citizens are out of work. And yet, under the Paris Accord, billions of dollars that ought to be invested right here in America will be sent to the very countries that have taken our factories and our jobs away from us. So, think of that," said Trump. "I was elected to represent the citizens of Pittsburgh, not Paris," Trump emphasized. Citing examples how Paris Accord is not in favour of the United States, Trump said- "For example, under the agreement, China will be able to increase these emissions by a staggering number of years -- 13. They can do whatever they want for 13 years. Not us". Continuing tirade against both China and India, Trump said, "China will be allowed to build hundreds of additional coal plants. So, we can't build the plants, but they can, according to this agreement. India will be allowed to double its coal production by 2020. Think of it: India can double their coal production. We're supposed to get rid of ours. Even Europe is allowed to continue construction of coal plants." Without naming China, but with obvious reference to Chinese tough trade practices, the President said, "The same nations asking us to stay in the agreement are the countries that have collectively cost America trillions of dollars through tough trade practices and, in many cases, lax contributions to our critical military alliance. You see what's happening. It's pretty obvious to those that want to keep an open mind". "The Paris Agreement handicaps the United States economy in order to win praise from the very foreign capitals and global activists that have long sought to gain wealth at our country's expense. They don't put America first. I do, and I always will," said Trump. Declaring that "the bottom line is that the Paris Accord is very unfair, at the highest level, to the United States," President Trump said, "Not only does this deal subject our citizens to harsh economic restrictions; it fails to live up to our environmental ideals. As someone who cares deeply about the environment, which I do, I cannot in good conscience support a deal that punishes the United States -- which is what it does -- the world's leader in environmental protection, while imposing no meaningful obligations on the world's leading polluters".